Multi-layers of moist cake with combinations of specialty fillings create these memorable cake confections. Our original assortment of petits fours...a little taste of heaven for everyone. 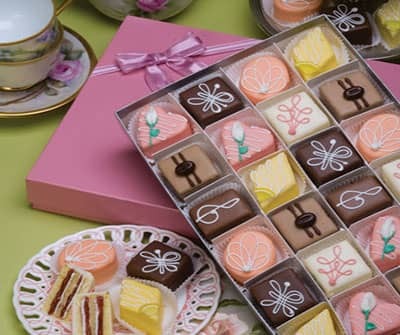 Let us select a special assortment of our chocolate and pastel favorites for you. Each of the petit fours is its own special hand decorated creation. Multi-layers of moist cake with combinations of specialty fillings create memorable cake confections. Varieties include: Luscious Lemon, Strawberry Heart, White Chocolate, Mocha Bean, Roasted Almond, Triple Chocolate, Chocolate Hazelnut, Grand Orange, Plum Squares, Milk Chocolate Squares and Raspberry Blanc. Where does the word "petit fours" come from? "Petit Four" means "small oven" in French. But it doesn't mean a really small oven - it refers to the heat setting. The lower heat, cooling phase that old French ovens went through was perfect for baking mouth-watering tiny pastries, and thus, petit fours were born. Yes and no. The petit fours on our site are all of the glazed variety, meaning sweet and iced. But petit fours can also be savory, like the appetizers you'd find at a cocktail party. Can I send petit fours to friends? Sure! It's never been easier to buy petit fours online with our multiple shipping address form. Have petit fours sent anywhere in the USA - they also make great business gifts as they are the right size for sharing around the office.